It’s official, proxy season is here, and judging by the amount of material we are already receiving, it is going to be another busy proxy voting season. 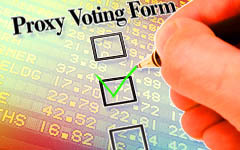 Just as a reminder, we take care of your proxy voting. You should not be receiving material in the mail related to proxy voting at this time. If you are receiving the stacks of reports, please contact Cathy at cathy@jkfinancialinc.com. We will immediately have the materials redirected to our office for review and vote. Much of the information we receive on client’s behalf is either electronic correspondence or a single packet for multiple recipients, in both cases more environmentally friendly than separate mailings.